What Is A 2007 Ford Powerstroke 6.4L Turbocharger? Over many years, we have made turbo upgrades to catch up with time most especially in the era of advance technologies. Ford Powerstroke Diesel Turbochargers are intended for high-level performance with minimal power loss. This is because of the difference in force among the lower outlet pressure ambient and the turbine’s constant upstream force. . We have everything from high pressure fuel pumps, glow plugs and even filter to keep your Power Stroke on the road. The turbo was created to top boost the pressure rapidly while creating the lease exhaust backpressure possible in order to drive the turbine wheel. The air is forced into the diesel engine’s chamber, this for fuel to burn competently. Because of this, there is a decrease in emissions that go through the exhaust systems that is released in the environment. Ford Powerstroke diesel turbochargers are intended to improve fuel combustion capability and power of the Powerstroke diesel engine. Factory and high – performance turbochargers are also available here at Taylor Diesel. Types of turbines are radial flow which is designed to stimulate the centripetal gas flow and axial that ensures the axial fluid flow. Ford Powerstroke Diesel Turbochargers come in handy if it gets damaged or broken. When this happens, the performance of the automobile depreciates with a very noticeable power loss. Removing and replacing an air filter sounds but if you are not that familiar, it is always best to consult with the mechanic most especially that the cause of turbocharger problem is only outdone by fuel issues. Both the good functioning of your fuel filter and the quality of your engine oil are very important for the good functioning of your turbocharger. One of the most important maintenance tasks is to regularly replace the oil filter. Because of the immense amount of horsepower that is created by a turbocharger and the extreme heat on which it maneuvers on, it is easy to conclude that this piece of vehicle does require extra care and maintenance for it to be durable enough. There are multiple things that you need to know in taking care of almost anything. The most common problem with turbochargers for the past years comes from the concentration of small particles that get there because of a damaged air filter. An important thing to consider for your turbocharger maintenance is the replacement of your air filter. When changing the filter, give it some extra attention to keep any possible debris from entering the engine by mistake. Taylor Diesel Group will always give you what you probably need. We offer you our aftermarket 2007 Ford Powerstroke 6.4L Turbochargers that we assure you will provide you more upgrades it has to offer. 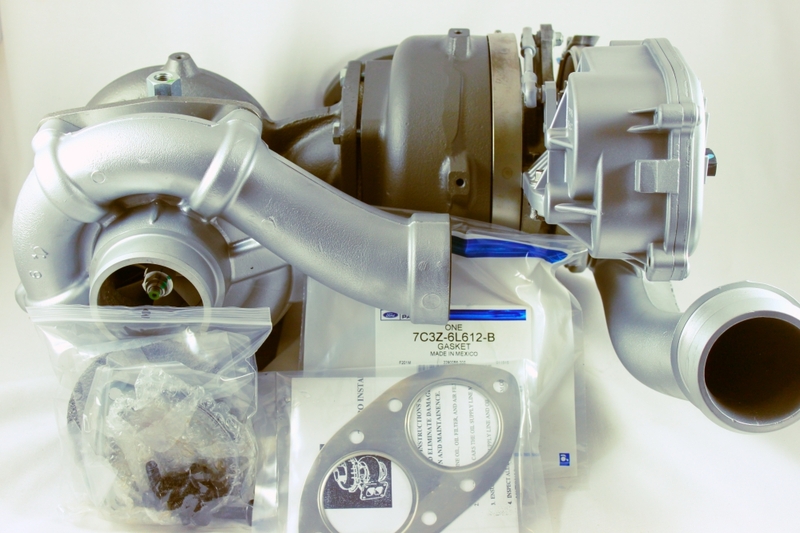 We also have replacement 2007 Ford Powerstroke Turbocharger in store. These have better upgrades and enhancements than their previous versions for the past years. Remanufactured 2007 Ford Powerstroke Turbocharger is one of our offered devices that come in good functioning with outstanding upgrades. Another good thing for the remanufactured 2007 Ford 6.4L turbocharger, is that it is more advanced than ever before. It gives your truck a kick and improvements more than what you expect. You can always get in touch in so many ways possible. So if you ever wonder where to buy the 2007 Ford Powerstroke Diesel Turbocharger, don’t hesitate to call or reach the Taylor Diesel Group! We have different locations through across various states which is convenient for customers that are located in different areas. Apart from offering our best prices that are as low as possible, we have everything convenient for you. You can check out our online stores or you may want to visit the Taylor Diesel actual stores since we have branches open in multiple states at various locations. Taylor Diesel Group upgrades our gadgets from time to time so we can catch up with the advancements we are currently in. We have a unique product because we’re a master distributor for the following major manufacturers: Holset, Borg Warner, and Garrett. Aside from this, we have been certified as well for training on turbochargers. Our products and services were truly proven and tested because we never stop until we have the right solutions for whatever problems you may encounter with your automobiles. Taylor Diesel is always here and we will always get you what you need. We got you covered, so put your worries aside! Taylor Diesel Group has been in service for quite some time that is proven and tested. We always leave our clients with a smile of satisfaction. Call us! We would love to hear from you and answer any questions you might have about diesel fuel injection and full service diesel repair,Where to Buy 1998 Ford Powerstroke Diesel Turbocharger, Ford F-350 Powerstroke EGR Cooler, Ford Powerstroke Oil Cooler and Exhaust Gas Re-Circulation Cooler Kit, Ford Powerstroke Glow Plug Controller, Ford Powerstroke Remanufactured Fuel Injection Control Module and more Ford diesel repair parts and services than we can list.